A detective takes a smoke break while working a case into the night. Click to license or to order prints. I’ve previously written about how to have flashes visible within the frame. In this post, I’ll discuss how I hid my main light within the frame. 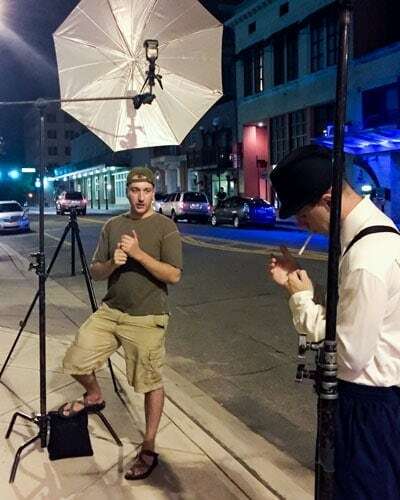 This image was shot in downtown Tallahassee, Florida, using traffic lights and other street lights to form the background. These lights are turned into glowing globes by using a large aperture (f/4.0) and a longer focal length (200mm) while keeping the subject (and focus) close to the camera. The ambient lights dictate my exposure. I used four speedlights to light James, our detective model. 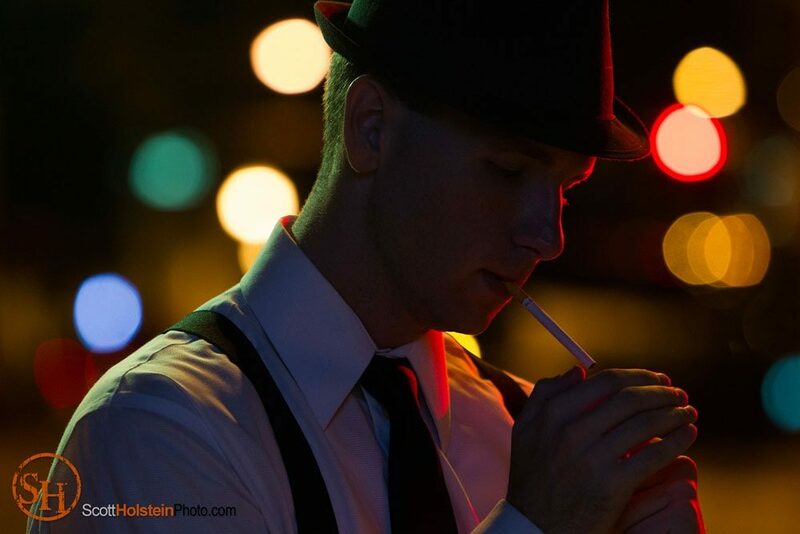 The trick to this shot is that his cigarette “lighter,” which is casting the light on his face, is actually a fiber optic cable hidden in his hands that is projecting a speedlight’s flash onto his face. Had I tried to cheat the “lighter’s” light from outside of the frame, it would light both James’s face and the outside of his hands. The hands being lit on the outside would be a dead giveaway that the lighting is artificial because the lighter cannot light the outside of the hands from its position within. The main light in the fiber optic cable did not fire in this frame. By comparing to the good frame, you can easily see the affect it has when it does fire. In order to solve this problem, my flash had to actually be coming from within his hands. However, the speedlight is too large to hide in his hands, so I needed to find a smaller light source. I tested various things but determined that I needed a fiber optic cable, which is used to transmit data as light. I got the cable and then used a funnel to guide the light into the cable and I used a snoot on the speedlight to guide the flash into the funnel. I gelled the speedlight to try to match the color a lighter would give off. The flash is sitting on the ground and the fiber optic cable is running up James’s shirt, down his sleeve, and into his left hand. By holding up his right hand to feign blocking the wind, he is able to hide the end of the cable. The blue light in the umbrella did not fire in this frame. By comparing to the good frame, you can easily see the affect it has when it does fire. Next, I put a speedlight to rim either side of James, one gelled red and one gelled green to mimic the traffic lights in the background. The lights are both somewhat behind the subject and snooted to keep their spill under control. Since they are mimicking the traffic lights that are visible in the background, I could only shoot in the traffic cycle when the traffic lights matched my setup. The fourth and final light is gelled blue and is bouncing into an umbrella. It is placed above the camera, in-line with the camera. It is serving two purposes. 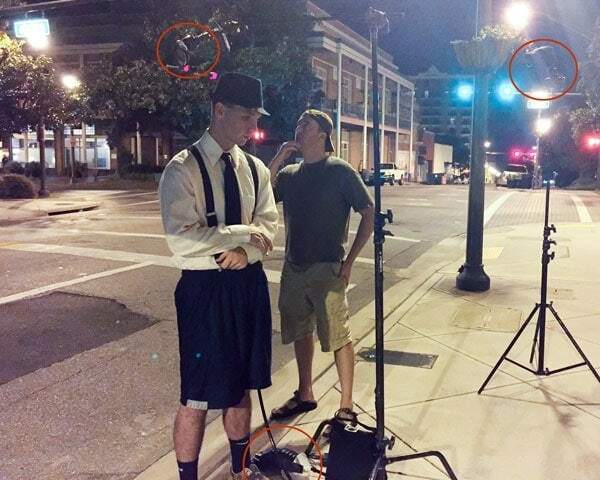 First, it is blocking a street light behind the camera that would otherwise affect the exposure. Second, it is filling in the shadows just a bit to keep detail, with blue signifying nighttime and darkness. Three of the four lights used to create the portrait, including the two rim lights (gelled red and green), and the main light on the ground, attached to the fiber optic cable. Since he is holding his main light, James is controlling the position of the light. Very minute changes in where he’s holding his hands and where he is aiming the end of the fiber optic cable have a great affect on the image, from the shadows on his face to the exposure. I told James generally where to hold his hands and where to aim the cable and then gave him direction throughout the shoot to tweak the positioning as necessary. The blue light fired into the umbrella, and its relation to the camera and the subject, used to create the portrait. Scott, this is pretty awesome and creative. I wish it were easier to control lighting in the wild but alas you do what you can with what you have.